A spokesman for Christie said the governor plans to appeal the "dishonorable complaint filed by a serial complainant"
Judge Roy McGeady issued the ruling Thursday. The case now goes to the Bergen County Prosecutor's Office, which will decide whether to bring the issue to a grand jury for possible indictment. There was no immediate comment from Acting Bergen County Prosecutor Gurbir Grewal. Grewal was appointed to the position by Christie in January when John Molinelli retired. The governor nominated him to permanently retain the position last month, and it wasn't immediately clear if Grewal would recuse himself from the case due to the potential perception of conflict of interest. Spectators in the courtroom applauded after Judge Roy McGeady's ruling. A judge has found probable cause for a complaint of official misconduct against Gov. Chris Christie related to the George Washington Bridge lane closures. Brian Thompson reports. Attorneys representing Christie declined to comment in court Thursday, referring questions to the governor's office. Brian Murray, a spokesman for the governor, called the filing a "dishonorable complaint filed by a known serial complainant and political activist with a history of abusing the judicial system." 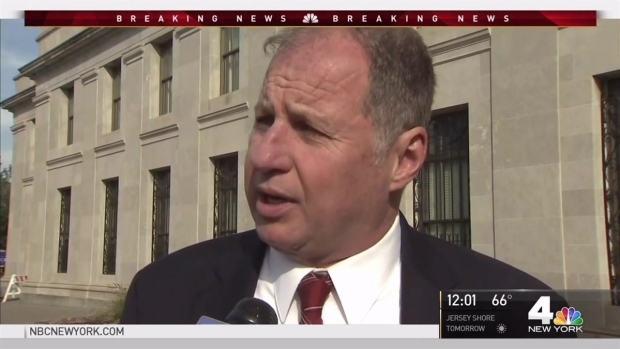 He added that Christie's legal team plans to appeal the ruling. "The simple fact is the Governor had no knowledge of the lane realignments either before they happened or while they were happening," Murray said. "This matter has already been thoroughly investigated by three separate independent investigations." The governor is on record repeatedly, and as recently as Tuesday, denying he was told about the closures the week of the shutdown. Activist Bill Brennan filed the complaint of official misconduct in the second degree against the Republican in late September. Official misconduct carries a possible sentence of five to 10 years. "He should spend seven years in jail for what he did," Brennan said after the hearing. Brennan said he filed the complaint, which alleges that Christie knew about the lane closures the day they happened and didn't require his subordinates to reopen the roadway, in part because the fallout of the 2013 lane closures cost taxpayers millions of dollars. Former Christie staffers Bridget Kelly and Bill Baroni face conspiracy and fraud charges for allegedly orchestrating the lane closures as political retribution against Fort Lee's Democratic mayor for not endorsing Christie's re-election bid. Their trial is ongoing. Brennan said his criminal complaint was over an accusation at trial by David Wildstein, a former Port Authority official and the prosecution's star witness, that the governor knew by midweek that the lane shutdowns were intended as political retaliation. Wildstein, who has pleaded guilty in the scheme and is cooperating with investigators, also testified the governor failed to seek criminal prosecution of his staffers once he found out about the plot. Three investigations into the scandal did not find evidence Christie authorized or knew about the lane closures, a fact that his spokesman reiterated after the summons Thursday. Federal prosecutors did not charge Christie after their investigation, a Democrat-led legislative panel failed to find evidence linking the governor to the plot and a 2014 taxpayer-funded report found the governor wasn't aware of the September 2013 closures until afterward.